Most travel ads promise you Heaven on Earth, but it turns out that tours to Hell are available, too. 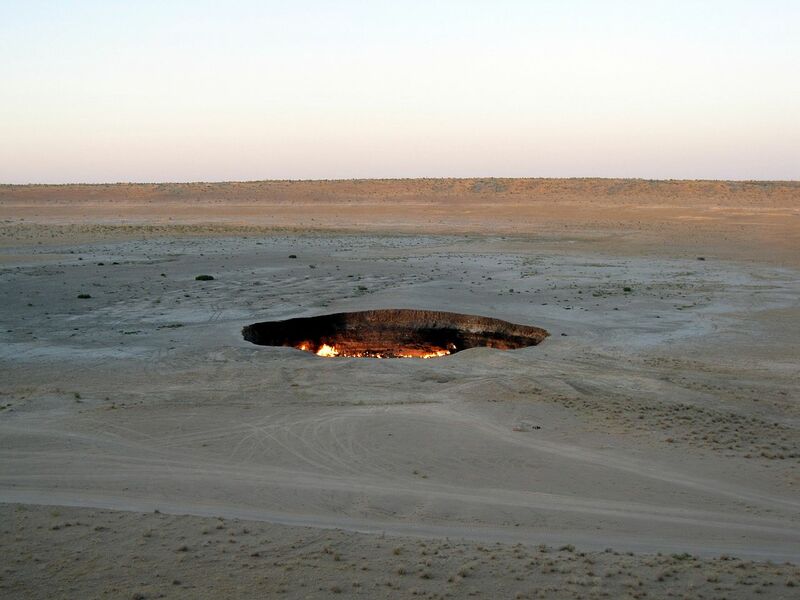 All you have to do is get a visa for Turkmenistan and head to one of its top destinations: Darvaza Gas Crater, known locally as The Gates of Hell. Although the sight and the smell of the crater will make you feel like you’re at the doorstep of the real Hell, you shouldn’t be afraid to step right up close. Darvaza has been burning since 1971, yet still no demons have ever emerged from its fiery maw. In fact, it was not some religious fanatic who dug out the fiery pit but a group of Russian workers searching for oil back in the ’70s (now they know it’s gas, not oil, that keeps the eternal flame burning). During the initial phases of the search, the drilling rig set to measure the quantity of oil was suddenly swallowed after the ground under it collapsed into a gas pocket. The workers were worried that the gas might poison the nearby villages, so they decided to set it alight in the hope it would burn out. Today, more than 45 years later, it is still burning. 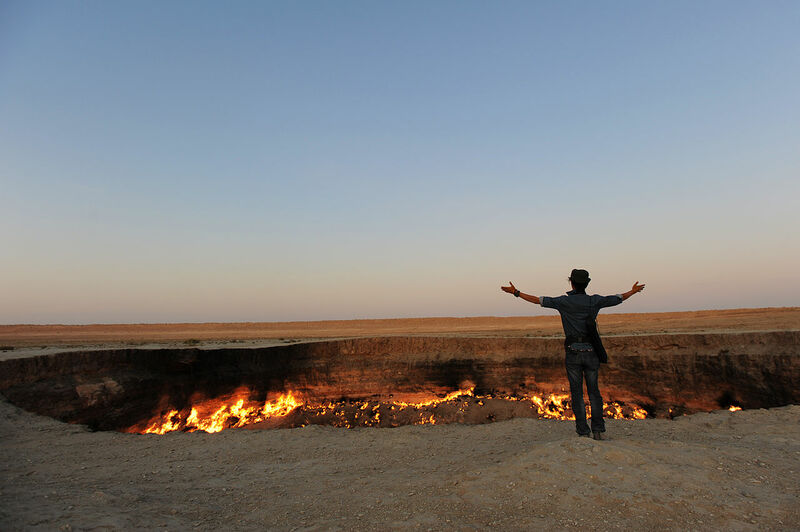 Although the President of Turkmenistan ordered that the crater should be closed in 2010, the Gates of Hell remain open to visitors and more popular than ever. Pop over to the small tea-house near the crater and enjoy a cup of tea looking out over the otherworldly scene. Once you’ve obtained your visa to Turkmenistan (and trust us, that’s the hardest part of this challenge), you can buy a tour from Ashgabat or you can organize a private trip by bus or taxi. It’s a four-hour drive from Ashgabat to Darvaza, and once you’re there you can pitch a tent in the desert, near the crater. Plan your trip so you can see the Gates of Hell at night – the desert, the stars and the gleaming red light from the crater create an incredible scene at sunset and sunrise. You will need a GPS to travel the 5 mi (8 km) from the now-abandoned Darvaza village to the crater. Bear in mind that you’ll need to cross desert terrain, so you might want to hire a 4×4 jeep or a local driver who knows the area well. Another important thing: the Google Maps pin named ‘Gates of Hell’ is wrongly placed. You should actually go to the site named ‘Darvaza Gas Crater’, which is 5 mi (8 km) further. Even if you don’t have a letter of invitation for Turkmenistan, you may be eligible for a transit visa, which will give you three to five days to explore the country. To qualify for the transit visa, you will need to show that you are en route from one country to another (ie. from Kazakhstan to Iran via Turkmenistan). If you want a tourist visa (which lasts up to three weeks), you need to buy it from a local travel agency. When visiting Turkmenistan on a tourist visa, you must be accompanied by a certified local guide at all times. Make your application well in advance of your trip – obtaining a visa to Turkmenistan is notoriously difficult and can take several months.